I’ve been in denial that fall is actually a season here in Texas until now. Friday I was sweating bullets at the State Fair on a typical 95 degree afternoon, but yesterday I woke up and it. was. fall. Seriously, I had to put on leggings for the first time and my body was so confused. But I’m jumping for joy internally because I love fall. To show my appreciation to this lovely season I’ve decided to share a few of my current favorites- definitely worth the look. Heaven in your mouth. I know what you’re thinking. “Oh Emma, you’re so basic.” You know what? If loving Pumpkin Spice Oreos is wrong, then I don’t wanna be right. I’m considering buying these in bulk to last me through the winter. If you have any respect for your taste buds at all, go buy these right now. A snuggle around your neck. I bought one of these amazing scarves from J. Crew a few years back and it is literally like wrapping yourself in a baby blanket, perfect for that necessary trip to the pumpkin patch- or maybe just a trip to Starbucks. I’m currently wishing for this classic acorn color- seeing as one the I own is bubblegum pink… And guess what? It’s on sale at J. Crew Factory- until October 13th! Calming chords. I’d consider Edward Sharpe & The Magnetic Zeros more of a constant favorite than a current favorite, but either way, I thought it was important to share their music in case you haven’t heard of them before (heaven forbid). Their hit Home never fails to put me in a fantastic mood. Stylish warmth. I got this gorgeous jacket on sale this summer in hope that I could get some wear out of it in college. Well surprise, surprise, it’s been too dang hot to even take it out of my closet. Luckily for you though, it is on sale! Grab it while you can. Totally worth the price. Making schoolwork cool. How cute are these engraved pencils? Anything thing that makes studying bearable is a good thing right? I need to get some of these asap. These boots are made for walkin’. I’m a sucker for a great pair of boots and these seem to be just that. My main man Steve Madden has done it again with these adorable quilted boots. I’m loving the authentic equestrian feel they have- maybe people will actually think I’m outdoorsy if I wear these… or maybe just fashionable. Either way its a win-win. Bedrooms need style, too. I came across PBTeen’s newest collection on Pinterest and fell in love. No seriously, I texted my mom and told her I wanted my room at home to look just like their pictures. They’ve managed to take “junk” and make it look flow together to look fabulous. And of course I’m loving the Texas feel it has! Definitely some inspiration for my next room redo. Blue October. As much as I love Texas, I’ve had some major hometown pride since I’ve moved down south! The KC Royals have been playing amazing and are well on their way to win the world series. So exciting for everyone in good ol’ KC! Charlie Hustle has been selling these vintage looking shirts and tanks for a while now and I’ve been dying to get one. They also come in red and yellow- go Chiefs! Pumping up your immune system. I came down with a pretty nasty cold last week and my mom suggested I go get a smoothie from Smoothie King to boost my immune system. It just so happens that that day they were giving out samples of their brand new Pumpkin Spice smoothie, and oh. my. gosh. it was so good. I know what you’re thinking: ew. I did the same thing. But it was amazing and now I’m constantly craving it and will probably end up spending all of my Frog Bucks on it. Well, that’s all I’ve got for now. I was not sponsored to post about any of these items- they were all from my personal opinions. 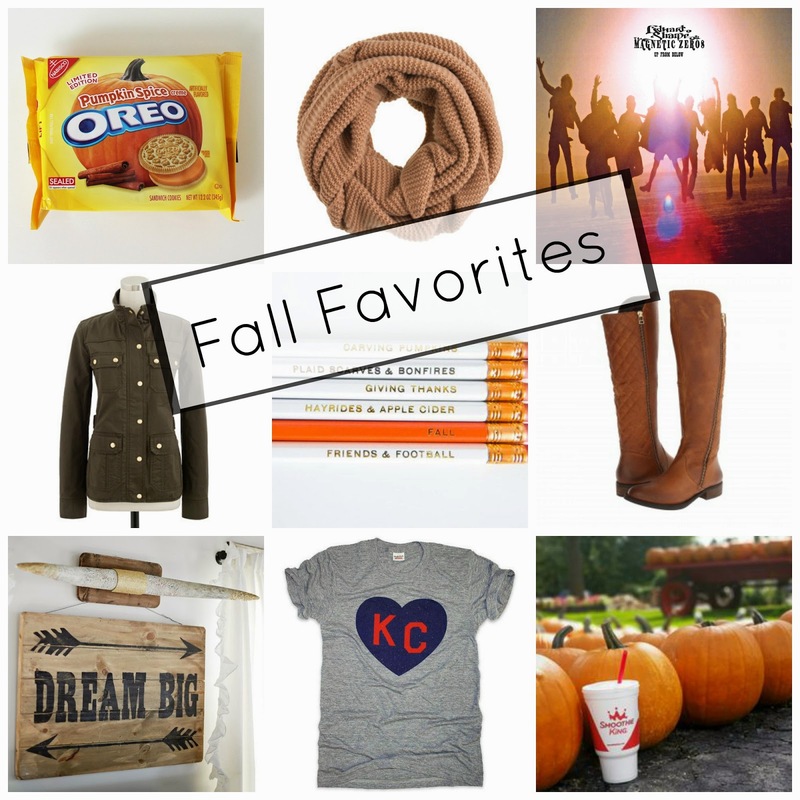 Hope everyone is having a great fall so far- I’d love to hear your input on my favorites- and hear some of yours, too!